Potatoes has been a big part of danish dinners for hundreds of years. Potatoes was a cheap and very filing food. But during the last couple of decades the starchy component of the danes dinner been switched to more and more rise and pasta. But the potato is a healthier choice. Both pasta and rice contains twice as much starch as potatoes, and having whole wheat pasta and brown rice doesn't help. We had potatoes on the menu 5-6 times a week at home. The potatoes were peeled, boiled and served with a brown gravy and some kind of meat. It was pretty boring. So the first 6 month of moving out, I didn't have potatoes - well I didn't make them my self. These oven-roasted potatoes is easy to make, they are tasty and colorful. You can use any vegetables you like, the method works for any root vegetables. Vegetables ready for the BBQ. Preheat the oven (or BBQ) to 400°F. Wash potatoes, peppers tomatoes and rosemary. Peel the onion and chop it into bits-size pieces. Peel garlic cloves. Add all the ingredients to a baking dish (or make a bowl out of aluminum foil) drizzle with oil and season with salt and piment d'Espelette. Roast for 25-40 minutes until the potatoes are tender. Serve with fish or meats. 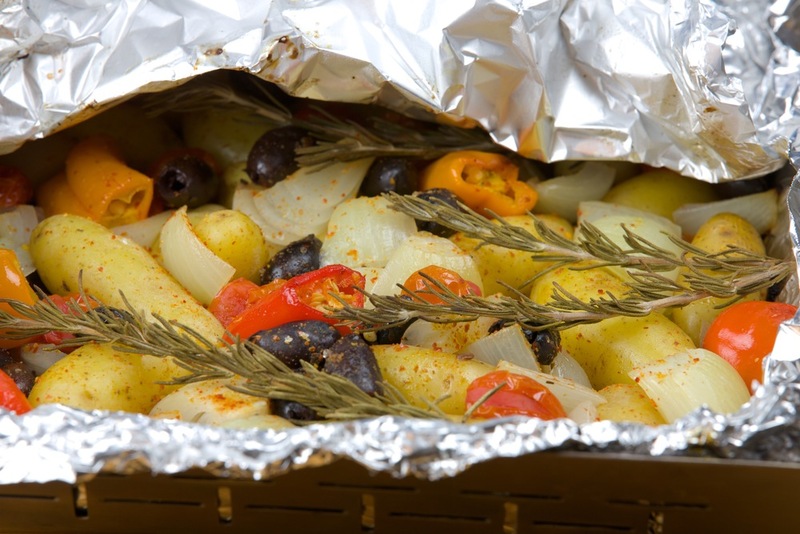 If you are roasting the potatoes on your BBQ, use indirect heat.